For this tutorial, we assume that you have Known installed and configured, and you are logged into your site. Let's post! 1. Go to the front page of your site and click "Post". 2. 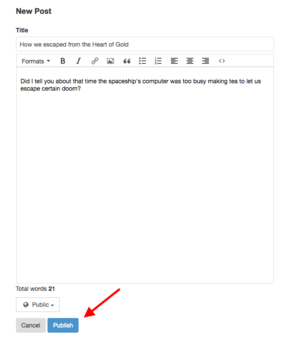 Write your post and click "Publish". Known also lets you publish pictures, location, events, and other types of data. Now that you are set up, they all should be working. This page was last edited on 30 December 2017, at 16:48.